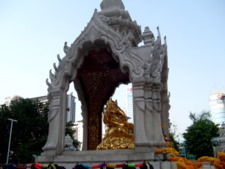 The Trimurti Shrine is located at the busy Ratchaprasong junction in downtown Bangkok at the corner of the Central World Plaza, (former World Trade Centre) across the road from the famous Erawan Shrine. Though less hectic than the Erawan Shrine, the Trimurti Shrine has an aura of its own. Legend has it that those who pray here for true love will have their dreams fulfilled. 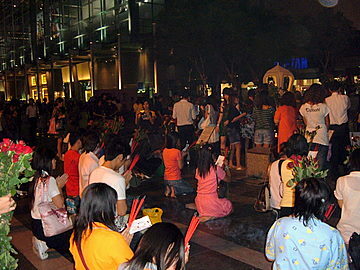 Worshippers are mostly local who normally come in the evenings to make their offerings of garlands and joss sticks. Trimurti refers to the Trinity of Hindu Gods consisting of Brahma the creator, Vishnu the sustainer and Siva the destroyer, the three most important gods in Hinduism. 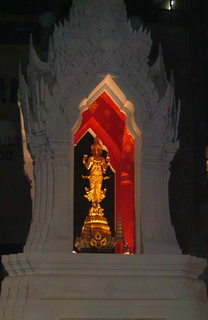 The deity is a gold statue of a human body with two heads and four arms. The heads are one on top of the other; the lower head has four faces. Built in 1989, the Trimurti Shrine is on a raised platform, sheltered by a dome on four pillars with elaborately carved gables at the four sides. There's an open area around the shrine with a ring of seats for worshippers to sit and reflect. Crafted in classical Indian sculpture with a Thai touch, the statue is a replica of the original from old Ayutthaya. 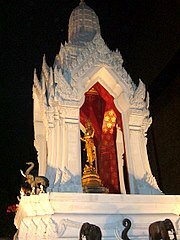 Like other shrines in Bangkok, the Trimurti Shrine was built to answer the prayers of people seeking success, prosperity and happiness. The shrine somehow acquired a reputation of granting happiness in romance, as it's very popular with young Thais who associate the shrine with the god of love. Legends build upon themselves and as the fame of the shrine grew, so did the flock of faithful. Such is the renown of the shrine that it's sometimes referred to as the Lovers' Shrine. There's an air of peace and serenity around the shrine and the place just has a natural draw for people. 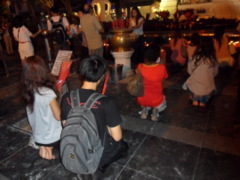 There's a small but steady flow of worshippers, young couples, pairs of women, single men and women, some after work. It's not just limited to the young though; elderly people have been seen there too. 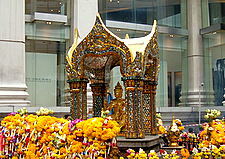 As with the Erawan Shrine the origin of the god in the Trimurti Shrine matters not to the worshippers who are steadfast in their faith that the shrine will meet their quest for happiness. 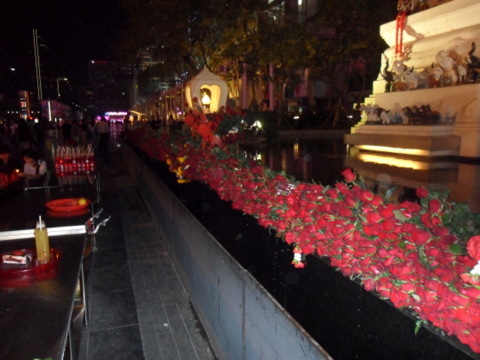 On Valentine's Day each year, the Lovers' Shrine is decked with red roses. 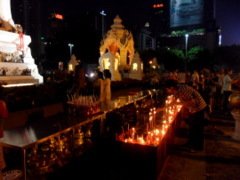 Flickering red candles cast shadows in the night as worshippers flock to the shrine. Young women with eyes closed, kneel before the Trinity of Gods, clasp joss sticks and pray with an intensity that's etched in their faces. Will their prayers be answered? The next time you're in Bangkok, drop in at the Lovers' Shrine and say a prayer for true love. Are you feeling lucky? Please note – the shrine has been moved from the corner of Central World Plaza at the Ratchaprasong junction (near the Erawan Shrine) to the far end that's nearer the Pratunam junction. The shrine now stands next to the Ganesha Shrine. 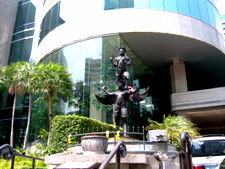 This move was due to the extension of Central World Plaza near the Ratchaprasong junction. 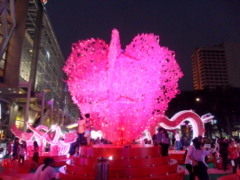 Valentine’s Day in Bangkok is very special for many Thais. Like many the world over, it’s a day signifying love. 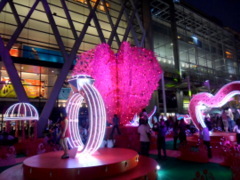 Red hearts and streamers flow in hotels, food and beverage outlets in the city. Cafes are stocked with heart shaped boxes of chocolate with cuddly teddy bears thrown in as gifts. In the evening, couples stroll hand in hand with the ladies clutching red or white roses; some by the stalk, others by entire bouquets. 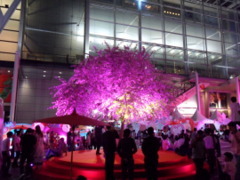 It’s at this shrine in the evening that you can experience the spirit of Valentine’s Day in Bangkok. 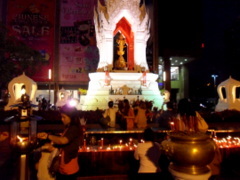 Commonly known as the Lovers’ Shrine, the Trimurti Shrine is exceptionally crowded on Valentine’s night. 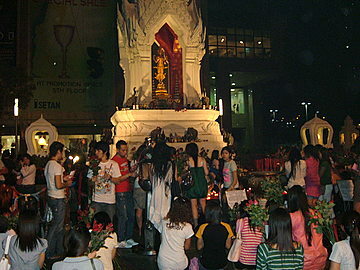 Crowds gather at the shrine holding joss sticks and roses to offer their prayers. With the current economic slowdown, flowers vendors have complained about a slack in flower sales. But judging from the roses stacked at the Trimurti Shrine, there doesn’t seem to be a slowdown here. 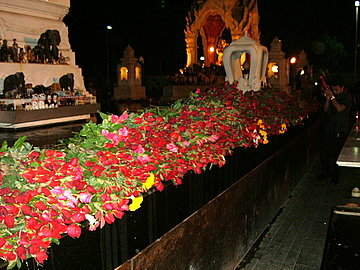 To return to Bangkok Shrines.